Mariel Rodriguez is very happy after undergoing surgery with boyfriend Robin Padilla at her side. 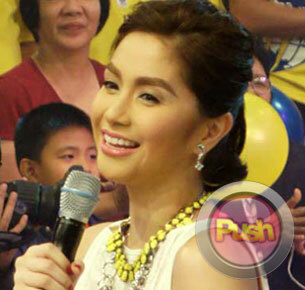 Mariel Rodriguez was very happy that an operation to remove a cyst in her ovary was successful. Though benign and not cancerous, the cyst still had to be removed as advised by her doctors. The TV host-actress was admitted at the Asian Hospital and Medical Center for surgery last September 1. At that time, her boyfriend Robin Padilla was in Bicol with his youngest child, Ali, but he managed to make it to the hospital the following day before the operation started. Prior to being admitted to the hospital, Mariel went on a weeklong vacation with Robin and his two kids, Kylie and Ali, in Hong Kong. They went to Hong Kong after the bloody Manila hostage crisis that left eight Hong Kong tourists dead and ignited the anger of some Hong Kong Chinese toward Filipinos. But according to Mariel, their vacation went very well. She even shared that while in Hong Kong she had the chance to go on a shopping spree with Kylie.